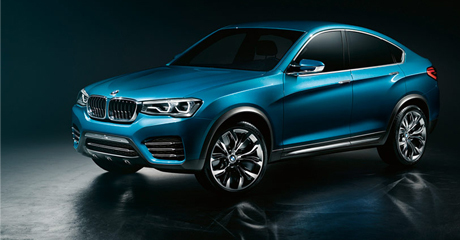 BMW confirmed that its long-awaited Concept X4 crossover would debut next year and will be introduces the at the Shanghai Motor Show later this month. “The face of the concept is an attractive blend of the current 3 Series sedan and the X3, while the roofline has definitely plucked right from the X6. This thinly veiled concept should carry over almost untouched when it enters production with the exception of the door handles and the overly stylized fascias and side mirrors,” according to Autoblog. 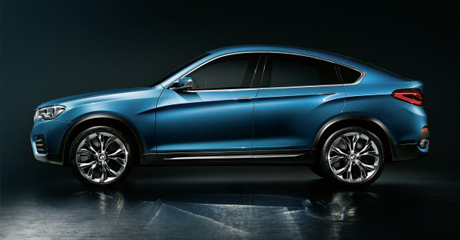 According to CarScoops, it will measure the same length as the current X3 and use the same engine lineup as well. The shape of the lights is a little more angular than the curvy units fitted to the 4 Series. The chunky wheelarches are almost squared off. The bumper is a lot deeper, though, and features some rugged underbody protection and two large exhaust pipes. Add the lower roofline and lower centre of gravity, and the X4 looks set to be one of the best-handling SUVs in the BMW line-up. BMW hasn’t provided any details about engines or transmissions – only that the X4 will come with the xDrive four-wheel-drive system. The car will be built at the Spartanburg plant in South Carolina, US. Prices are expected to start at around £30,000 when order books for the X4 open early next year.